I think this is the first time I XC skied this part of the forest. Two or three years ago I went from Echo Valley Parking lot on some morning when it was 4 degrees and only did it for half an hour. Weather was much nicer today, though, and with eight to ten inches of snow on the ground it was nice. What made it even nicer was the crust on top and soft snow underneath. Did a nice climb up the Polly Brody, then came back on the Mulikin. 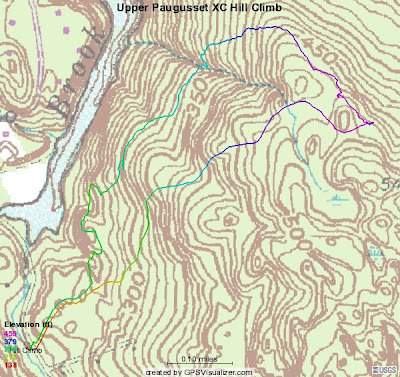 Bad news though, the ATVer went up the Upper Gussy section off of the Polly Brody. Didn't feel like following his tracks to see how far he went in but we are going to have to get creative to keep this person off the trail. Got some new gear today? Heard that Outdoor Sports Center was having a biking shoe sale so I decided to pull the trigger on some Gore-tex, winter riding shoes from Shimano. They were normally $170 and I got them for $119. I guess they were not part of the sale but when I said that a friend of mine got them for $120 last week, the sales guy took 30% off, and I was telling the truth, too! A riding buddy who lives in Ridgefield got these for the same price. Finally got the matching pair of Kinai knee and shin guards from Specialized. I have had the elbow and forearm guards for two years now and have wanted to get the matching knee guards but my Rockgardns were still in good shape so I didn't see a good reason to replace them, however, they are almost shot, so it's time for some replacement. So now, I will look good in the forest with matching elbow and knee guards. I got out and went snow shoeing this weekend in all the snow, it was really fun!